How Does DART Support North Texas’ Workforce? Have you ever wondered the role DART plays in helping folks get to and from their workplace? Today we are giving you the numbers and breaking down DART’s role in helping North Texans travel safely to their places of employment. The Bureau of Labor Statistics tells us there are about 2.6-million jobs in the Dallas-Plano-Irving Metropolitan Division, which includes jobs located in cities and communities outside of the DART service area. Here at DART, we’re proud that every major employment destination is located inside the 700-square-mile DART service area and includes downtown Dallas, Las Colinas, CityLine, Plano, and Addison. DART’s goal is to get North Texans wherever they need to go safely and affordably. We know that connecting residents with their places of employment benefits not just individuals but our entire region. Relieving congestion, supporting our workforce, and stimulating economic growth are critical benefits a multi-modal transportation system can provide. 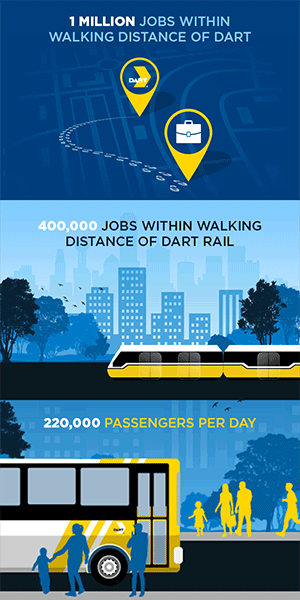 That’s why DART’s committed to developing new large-scale transportation projects, like the D2 Subway and the Cotton Belt, along with optimizing our bus network, to make sure North Texans are connected to their communities and their jobs.